Our drive to Mardin from Sanliurfa was a difficult one. We learned that when Turkey repaves and widens its roads, it digs up a 50 mile stretch of road at one time, leaves it unpaved, and then continues to dig until your trip from one town to another is nothing but a bumpy, dusty ride. 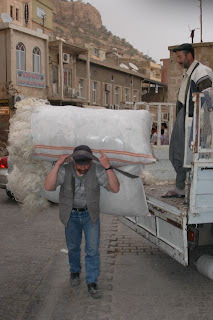 And, that is what we faced -- or more accurately our driver Vartan faced -- from Sanliurfa to Mardin. The trip took 3 times as long because of the poor road conditions. If anyone was going to get car sick on this trip, that was the day. Our journey was long, but the end result worth every second. The day was hazy, and warm, and as we passed along the road, the area changed from flat wheat fields, with a mix of more modern homes (modern = box-like brick or stone supported by wood beams, and cement, sometimes colored) to the most primitive shacks of hastily assembled mud, topped with aluminum or straw and wood, to tents for those who were working in the fields. Alongside the road we would see men dressed in suits, or "shalvar" (balloon legged) pants, women fully covered in traditional Muslim dress, often with the full-face covered, and primitive modes of transportation (wagons, bikes with baskets attached to the front), carrying fruit, vegetables, or other items on their way to market. We saw plenty of big trucks, carrying goats, sheep, tomatoes, potatoes, and constructions materials. After a long bumpy ride, we passed an Army base on the edge of the new part of the City of Mardin. Ahead of us, we could see the old village of Mardin, built on the steep slopes of the mountain. All I could wonder is whether, once again, we would have to climb up steep flights of stairs, with our luggage, to get to our hotel! But, we were granted a reprieve. We drove along a very nicely paved, wide, road gently rounding the hill (much like the drive up to Lake Arrowhead), and soon we came around the back side of the mountain to a very narrow road. That was the main street of old Mardin, above which we saw the ruins of another ancient castle running across the length of the city. As we turned onto the street in the center of the town (really the ONLY street) that would lead us to our hotel, we realized that our family -- Zorah, Queeny, Rose, Karnig, Nishan and Diran -- walked these streets as children. For Diran, it was his home until he was a teenager. For Karnig - we are not sure whether the Chechen nomads had raised him in this city, or whether he was taken to live as a Kurd or Nomad in some nearby village. According to Queeny, during their march south from Diarbekiyr toward the Der Zor desert, nomads wearing "kilts" grabbed Karnig, who was about 7 years old at the time and took him from her. Our research has led us to believe that the nomads who took him were called "Chechen" nomads. Queeny's and Zorah's attempts to keep what was left of their family together were defeated when it came to Karnig's future. But, as was often the case, children like Karnig were not killed by their captors, but raised as their children in their faith. We have found this to be true of many of the Kurds we have met and spoken to on this trip. Thus, we all hoped, as we entered Mardin, that Karnig met the same fate -- and that maybe his children and grandchildren were somewhere in this area. Our van pulled up in front of a restaurant, just a few doors down from the hotel. There, we saw several residences that looked like what my grandmother had described to us -- two story (plus basement) buildings, with a door opening on to the street, and a balcony looking down onto the street. Our hotel was one of those homes, converted into a modern resting place for the many travelers who come to visit this town. I was able to look up some of the very narrow step stairways, and could see that they led up to more homes of the same type. In 1915 to about 1917, my grandmother and her sisters lived in those types of homes off that street, and worked as servants for the families who took them in - saving them from near certain death from the hot march to Der Zor. From one of those balconies, my grandmother told us how she looked down one of the many days she used to stand on the balcony crying for a reunion with her brothers and sisters, and saw her sister Rose, covered except for her eyes, walking toward the shops. She recognized her immediately, called out her name and was reunited with her younger sister, who was also living with a family in that small town. On another day, my grandmother went to the local well (which we were unable to locate) and found her cousin Vartouhi, who told her where to find her older sister, Zorah. Zorah and Queeny also knew that their brother Nishan was with a Turkish family nearby, and was being raised as their son. 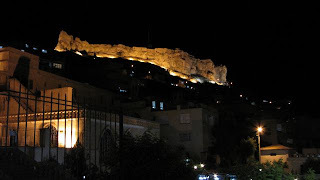 The town of Mardin was the beginning of an emotional 24 hours for us. 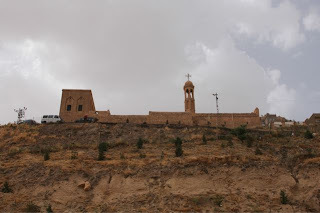 We visited a local Assyrian Church, sitting just below our hotel. The caretaker was a Christian woman, who kindly opened the gates for us, and let us walk through the church, which had been restored. It's old wood doors were still guarding its traditional entrances. Outside of the church, but still within its walls, we saw a graveyard, containing both old and new graves. 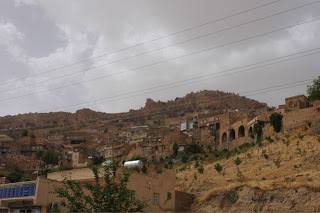 The town of Mardin is inhabited largely by Kurds, as is a lot of the area from here north to Diarbekyr and east to Van. We found the people in the town to be kind, friendly, and very hospitable. After checking into our hotel, and a late lunch, we walked the main street of Mardin, looking at silver shops, baklava and pistachio shops, and the usual vendors. Mardin was involved in heavy conflict between Turks and Kurds over the past few decades. However, in the past few years, that conflict has subsided and the town is now a popular location for visitors, particularly from other areas of Turkey. We were fortunate on that Sunday not to encounter lots of tourists. As a result, we could wander the main street, and a few of the upper stairways, and imagine what life must have been like for Queeny, Rose, Zorah, Nish and Diran nearly 100 years ago. After dinner, Lisa and I walked along the main street with Marineh and Vartan, and viewed the old castle lit up for everyone to see. As we passed the main square and tourism office, Marineh pointed out the small bell tower of an Armenian Church -- the church no longer exists. But, its bell tower has been incorporated into the building that is now the Museum of Mardin. From the square, we walked up a dark, narrow walkway (leaving the flashlight in the hotel room - duh! ), which Vartan explained would lead us to another abandoned Armenian Church. 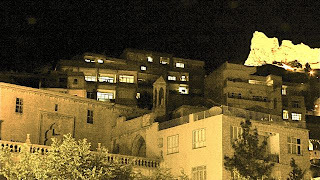 As we passed cats roaming the street (9:30 p.m.), garbage thrown in corners, and windows high up where we could hear voices, we reached the Armenian Church, which now stands with its windows barred, and its doors locked. This sanctuary has little to show that it is of Armenian origin, although a few of its windows and doors have the traditional archways. Sadly, earlier in the day Marineh and Vartan were unsuccessful in convincing a nearby caretaker to open the doors to allow a short visit. We returned back to our hotel to sleep and ready ourselves for what was undoubtedly the most emotional day for Brian, Adrienne, Susan and Debbie -- our visit the next morning to Diyarbekir. For me, this day in Mardin was special -- I spent quite time walking along the streets, trying to imagine what life must have been like for my grandmother, Aunty Rose, Uncle Nish and Uncle Diran (who did not know of his origins until many years later). I tried to imagine what the main road must have looked like in those days, with horses carrying travelers up the steep road. I wondered what my grandmother must have felt, knowing that her parents, grandparents, aunts and uncles were dead, and that she, along with her older sister Zorah, were responsible for keeping her young siblings together. I wondered what my grandmother would have said (actually, I know what she would have said) if she were alive today and knew that I was returning to her second childhood home -- where she suffered indignities and fear in her young teen years. Most important for me, I knew that this town most likely began to shape my grandmother into the dignified lady she became -- a strong, confident and determined woman, who always treated everyone she met with respect; whose deep sense of family was ingrained into her spirit until she died, and which she insisted that her daughter, grandchildren, brothers, sisters, nieces and nephews, carry on as they moved through their life. I felt that in Mardin our family started a new journey -- the Amirians are who and what they are in significant part due to what those who preceded us endured in this small hilltop village. I am very happy that we had the opportunity to visit Mardin.